Kaitlyn joined Watsi on July 16th, 2015. Four years ago, Kaitlyn became the 1354th member to automatically support a new Watsi patient every month. Since then, 3,723 more people have become monthly donors! Kaitlyn's most recent donation supported Maxwell, a baby from Kenya, to fund hernia surgery. Kaitlyn has funded healthcare for 46 patients in 12 countries. John is a student from Kenya. He is the seventh born in the family of ten children. He was burned on his right hand and has developed a contracture. This has limited the movement in his right hand. Fortunately, our medical partner, African Mission Healthcare Foundation, is helping John receive treatment. On March 12, surgeons at their care center will perform a burn contracture release surgery to help him use his hand again. Now, he needs help to fund this $799 procedure. Sareth is a housewife from Cambodia. She has two daughters, two sons, and ten grandchildren. She likes to watch Thai dramas on TV. 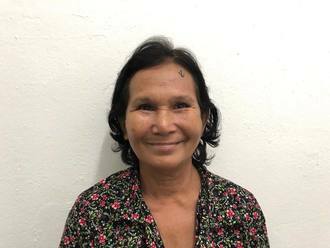 Two years ago, Sareth developed a cataract in each eye, causing her blurry vision, itchiness, tearing, and clouded lenses. She has difficulty seeing things clearly, recognizing faces, and going anywhere outside. When Sareth learned about our medical partner, Children's Surgical Centre, she traveled for ten hours seeking treatment. On January 9, doctors will perform a small incision cataract surgery and an intraocular lens implant in each eye. After recovery, she will be able to see clearly. Now, she needs help to fund this $398 procedure. She says, "I hope my vision is clear so I can cook and take care of my grandchildren." 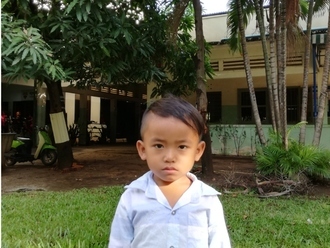 Pheaktra is a four-year-old boy from Cambodia. He likes reading and eating fried fish. He likes to play with his toys at home and to watch TV. Three years ago, there was an accident while his parents were cooking in the kitchen and his fingers got burned. Burn scar contractures have developed, tightening the skin around his burn. It is difficult for him to bend and use his fingers. When Pheaktra learned about our medical partner, Children's Surgical Centre, he traveled for three hours seeking treatment. On September 11, surgeons at CSC will perform a burn contracture release surgery to to help him mobilize his fingers again. Now, he needs help to fund this $448 procedure. Meet Paul, a father of two children from Kenya. He used to work as a maintenance officer on a flower farm. His wife works as a laborer. In February, Paul began losing his vision. He underwent an MRI in April and was diagnosed with a brain tumor. It has been recommended that Paul undergo a craniotomy to remove the tumor. If he is not treated, he will be at risk of permanent blindness. Fortunately, Paul's surgery is scheduled for July 9. Now, he needs help raising $1,495 to fund treatment. Paul says, “My wish is to have the tumor resected and be able to regain my sight." Beatrice is a baby from Kenya. Her mother is a full-time mom, while her father works on construction sites. Beatrice is the youngest of three children. Beatrice was born with spina bifida, a type of neural tube defect in which the spine does not properly close around the spinal cord. Without treatment, Beatrice is at risk of lower-limb paralysis, infection of the exposed nervous tissue, development of tethered cord syndrome, and possible developmental delays. Our medical partner, African Mission Healthcare Foundation, is requesting $1,097 to cover the cost of Beatrice's spina bifida closure surgery. The procedure is scheduled to take place on June 21. This procedure will hopefully spare Beatrice from the risks associated with her condition, instead allowing her to grow and develop along a healthy trajectory. “If I had financial ability I would have come in earlier,” shares Beatrice’s mother. Kimsrieng is a government worker from Cambodia. He has one daughter. He likes to read the newspaper and listen the news on the radio. 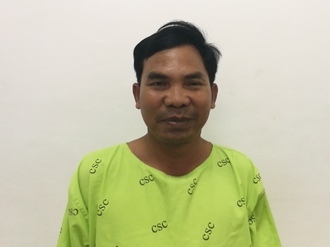 One year ago, Kimsrieng developed a cataract in each eye, causing him blurred vision and photophobia. He has difficulty seeing things clearly, recognizing faces, and going anywhere outside. When Kimsrieng learned about our medical partner, Children's Surgical Centre, he traveled for one and a half hour seeking treatment. On April 23, doctors will perform a phacoemulsification surgery and an intraocular lens implant in each eye. After recovery, he will be able to see clearly. Now, he needs help to fund this $398 procedure. He says, "I want to continue my work and spend time with my family."